Swapping half and half for cream and thickening the chowder with potatoes lightens this comfort food up for a weeknight meal. Before I set you free with the recipe, I want to talk about this photograph for a minute. Traditionally food isn’t shot in high contrast light, but there are situations where it works better than diffuse light. When you need to highlight texture or the food is plain looking you can sometimes increase the visual appeal with shadow and harsher light. For this photograph I brought the chowder into an interesting diagonal shadow coming through the window in the warm late afternoon light and put a polarizer on my 50mm macro lens. I then softened the light with a soft box coming in at the same direction. With my focus on the chowder, I shot it at a fairly low aperture of f/3.2 to soften the image around the bowl and to bring the intensity of the harsh light down a bit more. If you're learning to shoot food I hope this gives you some fun ideas to try, but now that I’ve more likely lulled you to sleep, here’s the tasty recipe. Do not add bacon. Do not pass go. Go directly to a kitchen, any kitchen, and make this corn chowder immediately. I promise you won’t regret it. 1. Heat the oil and melt the butter until it foams in a large pot over medium high heat. Add the onion and sauté until softened and starting to turn golden; about 10 minutes. Turn the heat down if the onions start to burn. 2. Add the garlic, Old Bay and thyme to the pot and cook for 1 minute. Add the flour and cook for 3 or 4 minutes stirring frequently. Deglaze the pot with some of the broth scraping down the bottom well. Then add the potatoes, the rest of the broth, parsley, salt and pepper and bring to a boil. Boil until the potatoes fall apart with a few pieces left; 10 to 15 minutes. 3. Add the half and half and bring to a rolling boil. Stir often and boil until thickened to taste. Add the corn and cook for 10 minutes stirring often so the corn doesn’t stick to the bottom. A little sticking is caramelizing, a lot of sticking is burning! Serve with good crusty bread. Mmmm how warm and comforting! I would love to make that for dinner tonight. I love how you describe how you took the shot. Thanks, it is helpful to people like me who are learning. I normally would follow a recipe as printed, but you said not to add bacon and now that's all I can think of. Either way, with or without, the soup looks fantastic and easy. I will definitely try with a crusty bread on the side. Great tips of shooting food... I'm a desperately trying to get out of auto~mode on my Nikon D60. :) I'm scheduled to soon have a lesson (a Mother's Day gift I'm just now using) which will hopefully help. But, your tips are great. 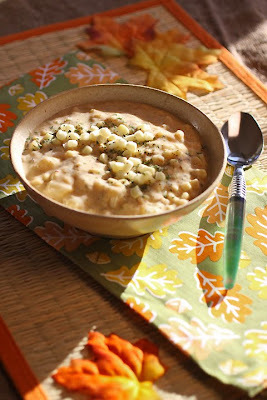 This is a great recipe to try now that the cooler fall temps are here. I love that you chose to make this lighter/healthier than traditional chowders. Oh lovely shot, I am in love with the colors and fork! Thanks for the photo tips- I'm trying to learn how to use hubby's camera, and all the help I can get is appreciated. I love your corn chowder- delicious! DO NOT ADD BACON?!!??!! How DARE you! lol--I'll have to try this, despite your blasphemy. I liked your tip on the photography but it was foreign language to me. When I get a good camera, I will come to you for help! Lol no really guys, don't add bacon. It sounds crazy but it won't work as well. Of course, I could be crazy. Who knows? Laura, I'm in desperate need of lightening up my meals! This sounds yummy:) Thanks for the lighting tips! I have SO MUCH to learn about photography! Your blog is what I aspire mine to be someday :-) Your recipes are wonderful and of course so are your pictures. I can't wait to read and see more of your posts! Hey Laura! LOVE this blog of yours- fantastic!! Question: what are those cookies called in the picture in your masthead with the gooey filling? Would love to give those a try. Thanks in advance!! Thank-you Clark! I just visited your page and you do beautiful photographs. Wow. Oh how I love corn chowder....living in New England, it was a mainstay at the table...I've always had it with bacon added..I'll trust ya and leave it out. Now to convince my husband to eat it-he sees milk based soup and FREAKS unless it has cheese in it. He doesn't know what he's missing. Thanks for the photography tips too.....with summer gone, natural lighting here is getting more limited every day-guess I'll have to do all my main cooking in the morning to hope for the afternoon light. We have lights but there's nothing like natural light. Great soup recipe! We have been eating lots of soup lately. Thanks for the photo tips too!